Objectives: I can answer geographic questions about early Europe including: Where is it located? Why did people settle there? What is significant about its location? How is its location related to that of other people, places, and environments. I can identify examples of limited and unlimited governments that existed in early Europe. I can identify and explain the reasons many early European societies attempted to limit the power of their government. I can tell whether the different forms of government found in early Europe where ruled by one, a few, or many people. Because of the natural barriers like mountains and seas, many communities in Ancient Greece developed independently of each other and were isolated from each other. The communities became known as city-states. City-states consisted of a town and the surrounding farms and grazing lands. A city-state was also called a polis. Each polis had its own government, laws, money and surrounding territory called the hinterland. Many city-states also had colonies in foreign lands that provided the city-states with valuable resources. City-states usually had an agora or central marketplace where people would buy and sell goods and crops. People could meet other people in the agora and it was a lively, active place. Shops, temples and government buildings were a part of the agora. An acropolis was also important part of a city-state. Acropolis means “high-city” and it was where social meetings were held regarding affairs of the polis. Use the resources provided to learn about the city-states of Ancient Greece. 2. Click HERE to complete an activity about the city-states. Make a copy of this document, complete the activity. Be sure to save this document to your Ancient Greece and Rome folder in Google Drive. Sparta was a polis on the Peloponnesus, a hilly, rocky area at the southern end of the Greek peninsula. The Spartans conquered many people in the region and forced them to work as slaves. They developed a disciplined society that value﻿d physical courage, strength and bravery in war. Athens was a polis on the southeastern part of the Greek mainland. The Athenian people valued reading, writing, and music. Athenians also believed that government should be ruled by the people and not a king. 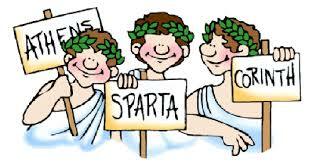 Use the resources provided to learn about the city-states of Sparta and Athens. 1. View the brief video clip and additional resources. 1. Imagine you are a merchant in the agora. Create an advertisement for The Greek Daily Blab advertising what you have for sale. 2. Imagine you are a youth of your same age and gender living in Sparta and in Athens. Create a diary (one for each youth) with multiple entries of daily events. 4. Entries must contain vocabulary and other factual information gleaned through your lessons.